One of the interesting aspects of a foreign trip is to examine how wildlife reserves are managed away from the UK. As well as a tour of Cape May sites, we spent a couple of days visiting a dozen or more sites around Delaware Bay. So how does US management compare with UK management? Firstly, the area of protected land in the US is remarkable, but it is a big country. There is not only an extensive system of Wildlife Refuges but also numerous major wetland restoration schemes. The Estuary Enhancement Scheme around the bay has aimed to restore functional tidal flow to marshes, resulting in huge areas of Cord-grass (Spartina) dominated saltmarsh. Since the introduction of regular tidal flushing at the restored 243 ha Little Creek, the saline mudflats within the impoundment have been heavily used by shorebirds (especially Short-billed Dowitchers and sandpipers) in spring and autumn, especially at high tide when the estuary mudflats are unavailable to them. The site has a monthly flooding regime during passage periods before deeper flooding in winter. Grass shrimps are abundant and these and the resident fish form the food base for waterfowl and wading birds. It is also now more heavily used by Snow Geese (up to 300,000) feeding on the abundant growth of Spartina. Not many of these restored sites seem to have much ongoing management though, resulting in rapid vegetation growth and a resultant loss of open habitat. 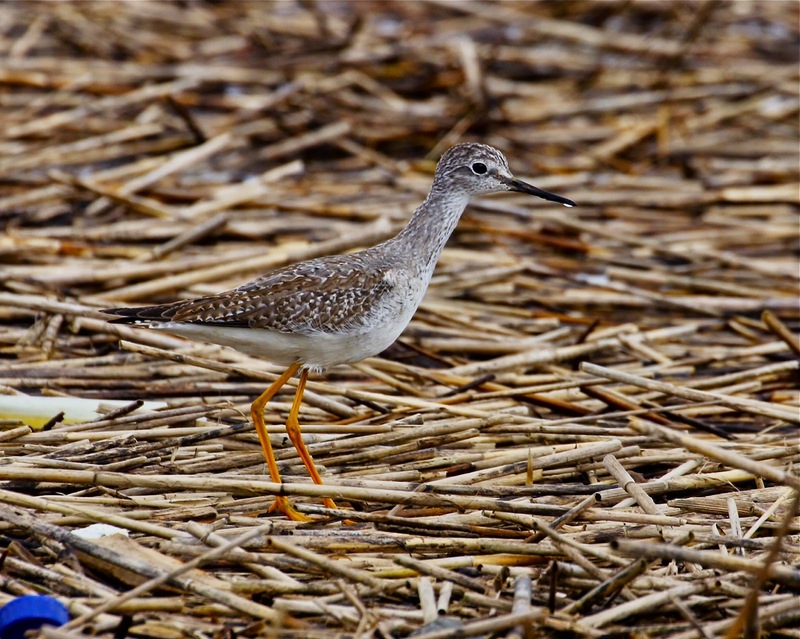 The Wildlife Refuges at Bombay Hook and Forsythe have bunded fresh and brackish lagoons. These sites are so large (Bombay Hook is 6,500 ha) that the main access is via a car route, with walking trails and viewing platforms around the site. Maintaining the populations of migratory waterfowl is a major objective at the refuges. The freshwater lagoons are drained down in spring, providing muddy areas for waders. During the summer, emergent plants grow across the lagoons, providing abundant food for waterbirds when the lagoons are re-flooded in the autumn. This practice of Moist Soil Management is widely used in the US. In addition, 450 ha of the refuge are planted with crops such as winter wheat, buckwheat and grass/clover leys specifically to provide food for waterbirds. Some of these areas are flooded. We don’t do much of this in the UK. Most of these sites have high viewing platforms. 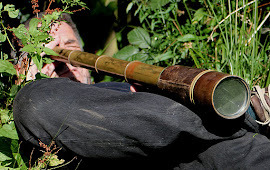 They provide good, high, long distance viewing but rarely any close views of birds. So how does the UK differ? Well our smaller nature reserves receive more intensive management of the habitats (perhaps too much in some cases). Where we restore or create new sites, habitat designs tend to maximise the value of a site, maybe again a reflection of the smaller areas we have to work with. Our reserves also tend to get people closer to the wildlife, either through site design or the range of infrastructure provided. All of this can be seen in the design and management of a reserve such as Minsmere. Richard Crossley’s vision is to bring these ideas together to create the best of both worlds. After looking at the pending restoration of Pond Creek Marsh at Cape May, we met with Dave Golden, the Chief of the New Jersey Division of Fish and Wildlife for some excellent discussion on possible designs. Perhaps we might see the Pond Creek restoration take on a more UK site feel. Likewise, perhaps we’ll see some US ideas popping up on this side of the pond. 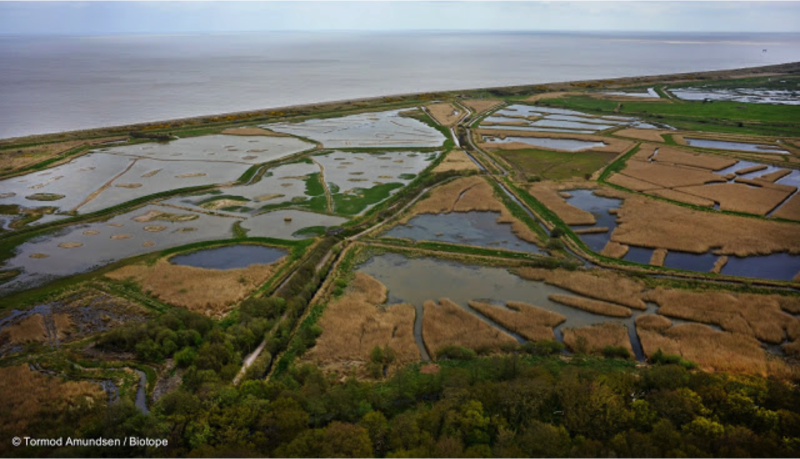 Pics from top: Western Sandp, Little Creek, viewing platform, Forsythe, ducks, Minsmere. Arriving at Cape May late into the evening, where we were staying with Richard and Deb Crossley, we were quickly informed that weather conditions were ideal for a ‘morning flight’ and so we were out at Higbee’s at 5.00am, ticking Great Horned Owl on the way. Dark shapes zipped through the half-light, the bushes ‘tick’ed and ‘zitt’ed, and as light arrived it was clear that many birds were on the move. Northern Flickers were everywhere, at least 200 passed over in the first couple of hours. Cedar Waxwings, American Robins and Bobolinks called from above and the bushes were alive with warblers and vireos. A viewing platform in the corner of one of the fields overlooks an area of scrub where the first sunlight arrives. A dozen or more species of warbler were prominent this first morning, including Tennessee, Nashville, Parula, Chestnut-sided, Magnolia, Blackpoll, Black-throated Blue, Hooded, Prairie and Black and White. The ‘morning flight’ at Cape May is an amazing migration spectacle. Morning flight is an after sunrise dispersal of migrants, mainly birds re-orientating and moving northwards up the Delaware Bay shoreline back from Cape May point. 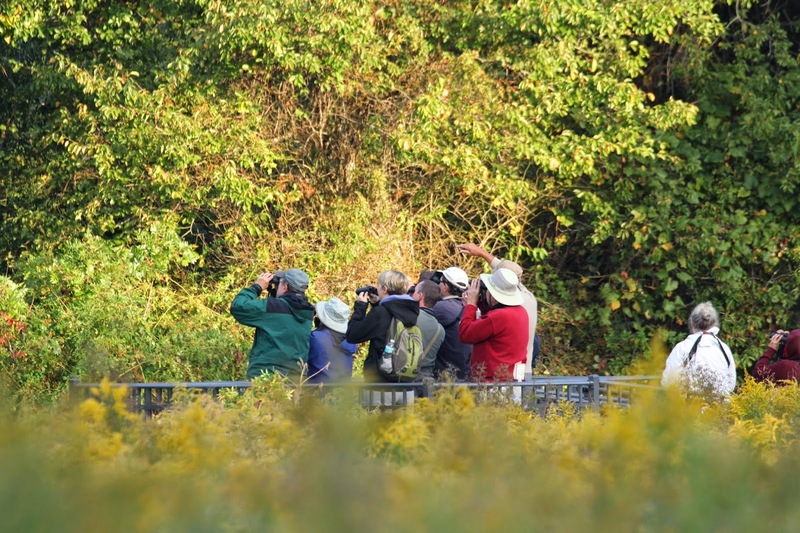 The fields and wooded areas at Higbee Beach is one of the best places to observe this movement. Some counts have been staggering, not least the 67,000 migrants counted on 13 October 2003, including 58,959 Yellow-rumped Warblers, and the 1,516 Flickers that day somewhat eclipsed our 200. 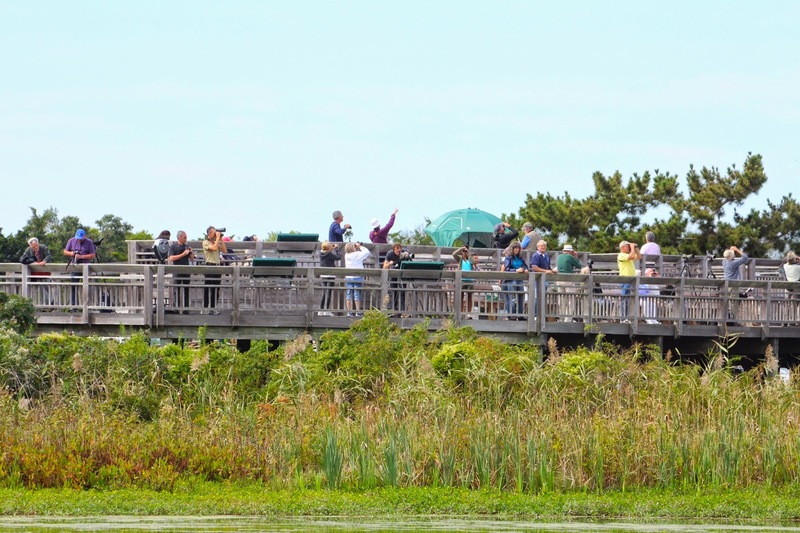 After the morning flight, the custom is to move down to the hawkwatch platform near the lighthouse or explore the Cape May ‘meadows’ or other less watched areas. 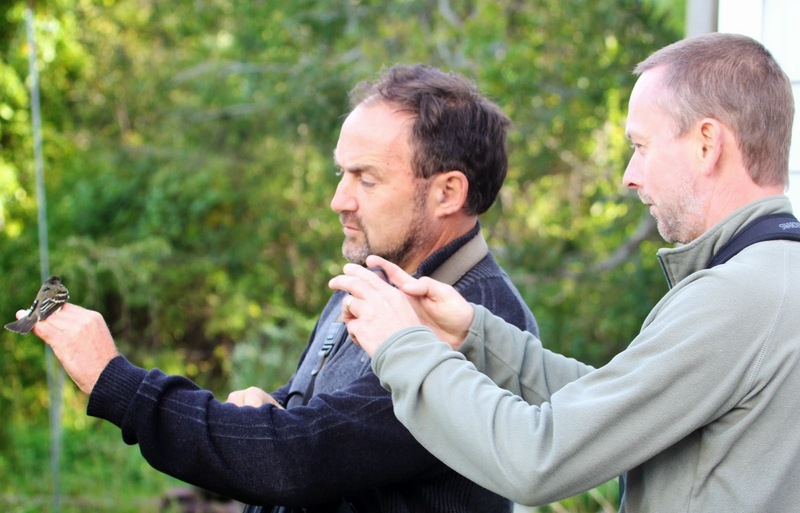 At the hawkwatch platform, birds are called and counted as they pass. That first day, 500 American Kestrels passed through according to the tally board. Over the following days the spectacle of visible migration was always evident; hundreds of Blue Jays endlessly flying through one day, thousands of Tree Swallows clumped in a bush another. There were raptors galore every day with up to 50 birds of 8 species circling above at peak periods, with Sharp-shined Hawks (or ‘Sharpies’ as they like to say over there) continually visible overhead. On the quieter days, we did the ‘must-do’ trips up to Stone Harbor Point and Nummy’s Island. Stone Harbor Point is a long sand spit to the seaward side of extensive saltmarsh. At high tide waders gather in numbers; numerous Western and Semi-p’s on the beach, Willet, Marbled Godwit and Short-billed Dowitcher in the saltmarsh. Rails, herons and egrets lurk in the dense Spartina beds. 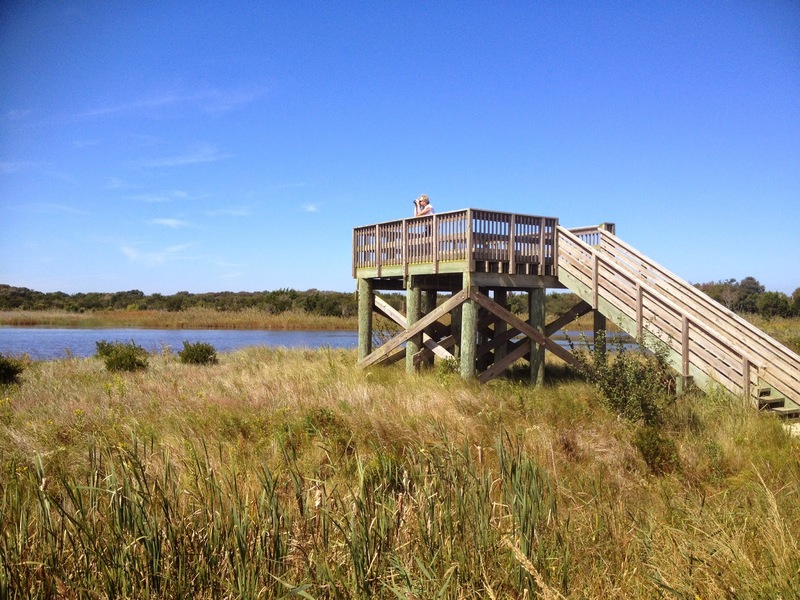 Further north, Forsythe Wildlife Refuge (aka Brigantine) is another location not to miss. Water levels were rather high on our visit but Seaside and Sharp-tailed Sparrows were there to be ‘squeeked’ and ‘pished’ out of the grass and scrub. 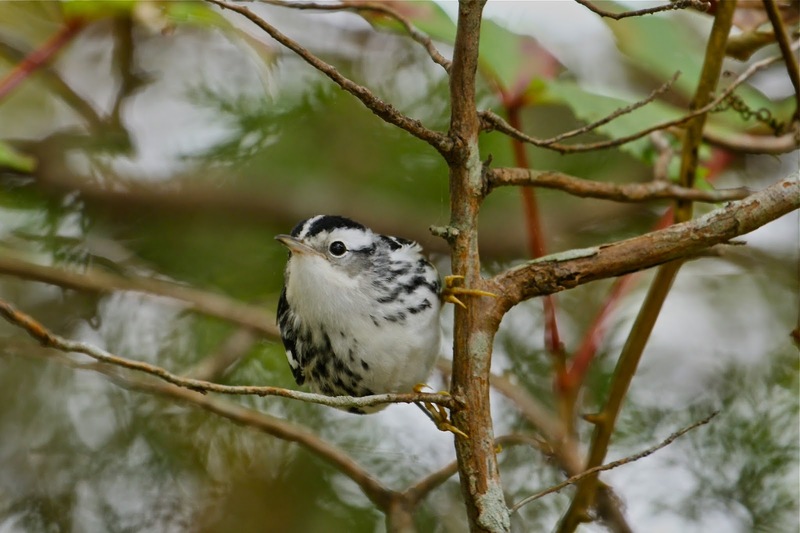 If visible migration is your thing, it is spectacular at Cape May. Pics from top: Sharpie, tree swallows, black & white, Higbee's, Short-b Dow, hawkwatch, flycatcher ID, Lesser Yellowlegs.